The saga continues in the HSR paintings by “Motor Marc”. The 10th Anniversary of the High Seas Rally cruise is sure to be a winner. This new painting takes that celebration even further. 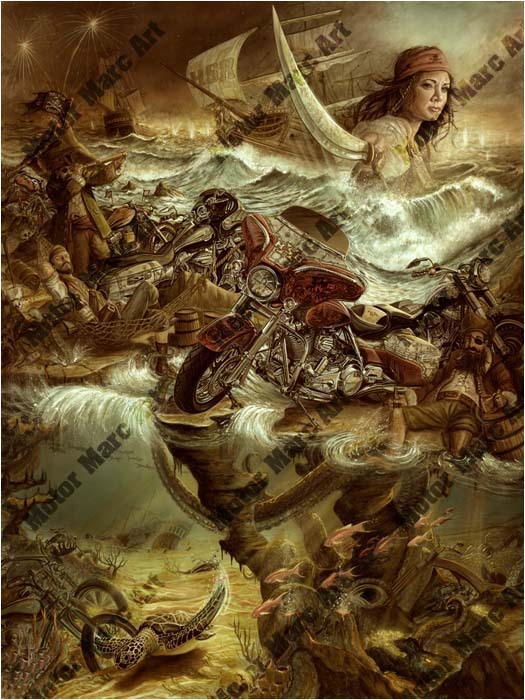 Ten motorcycles are featured as the bounty in this pirate “Hidden Treasures” series. A Caribbean Isle is the treasured land for the guardians as they look to golden skies, and glistening sand for more treasure adventures. Order your 10th Anniversary painting now as this treasure is limited.